In this last chapter of this eight-part series, I want to focus on bad beats, frustration, downswings and how seemingly totally unfair this game can be. The reason most serious players keep hefty bankrolls is because of how variance never fails to eventually knock you over, and then proceed to kick you while you're lying down. If you haven't had a meaningful downswing yet, there's a very, very good chance you haven't played for very long. Being prepared for it, both financially and mentally, is a virtual necessity if you want to go as far as you can. When I say "financially prepared for it," I basically mean that you have a bankroll that can deal with some swings, and that you've planned for the eventuality of a larger downswing happening, of such magnitude that it may force you to step down in limits. Thinking that a good player rarely loses is just plain wrong, because - quite frankly - winning poker means pushing edges, even the smallest ones. When you push a 52% chance of winning, you're going to end up losing virtually half the time. And sometimes, you're on the wrong side of the coin for an extended period of time. Of course, you could pass up the small edges and focus solely on the large edges, which would negate some of your profit, but it would also bring with it less variance. Personally, I want to play to win as much as I possibly can, and I keep a large bankroll to be able to do so. What may be trickier to deal with is being mentally prepared for it. No one really knows how they'll react to losing half of their bankroll playing solid poker against poor players until it happens to them, I'm guessing. What happened to me was, and I think this is pretty typical, that I started questioning whether or not I was a winning player at all, if I had just had luck so far, or perhaps if I had suddenly become worse at poker. I got sick of the game for awhile, hovering with the mouse pointer over the PokerStars icon and then deciding to watch TV for awhile because I didn't want to lose even more. Bad beat, after bad beat, set of aces cracked by a runner-runner flush, big pots lost because no one ever folds, etc. I've since been through a couple of more downswings, and I know I'll keep running into them. They're inevitable. Knowing that they're inevitable is a big step. Understanding why they're inevitable means you've come a long way. Accepting them for what they are - and thereby accepting poker for what it is - means that you've reached the point you need to be at. The problem with downswings is similar to the problem with reverse reinforcement. You may be playing well but you're still losing, which can cause you to believe that you're not playing well after all and in turn this can make you change your game for the worse. This is dangerous. In the short term, this is usually referred to as "tilt." Someone who refuses to raise his two pair on the flop when there are two hearts there, because "someone will just hit a flush and I'll lose more money," is a good example. The real problems arise when this is no longer just a state of mind that we're in for a little while, like the rest of the night or for 15 minutes or something, but when our game permanently changes because of this. Understanding how poker works, that mathematically and logically the universe is not out to get you, is very important in order to counter this behavior. Being able, away from the table, to rationally realize that what happened tonight was just variance, that your losses are at least smaller than they could have been had you not played as well, is imperative. When you don't have the cards in front of you, you can afford the luxury of thinking things through, mulling it over, and reaching the correct conclusion. Unfortunately, it's not as easily done while still at the table. Short term tilt is, for me, mostly a small problem. I believe I have it under control, but of course it's still hard to smile and think happy thoughts when the same guy beats your flopped pair of aces by calling your bets to the river only to turn his third-pair-hand into two pair or trips, for the fourth time in a row. Being rational about it right then and there is really, really hard. You know that you were doing the right thing to bet, and you know that he made a mistake in calling, and in the long run you'll win a lot of money if you keep it up. But that doesn't help you right now, does it? No. You're still down for the session and you're pissed off about it. Now, leaving the table when this happens is, for most people, probably a good idea. If you find yourself upset, to the point where you know that it's probably affecting your decisions, then staying at the table is really bad. The fact that he's a complete donk and that if all other things were equal you'd be making a fortunate off of him in the long run may not be enough of a reason to stay. Because not all other things are equal, not if you're on tilt. Be honest: Haven't you ever been more prone to raising or calling a certain player because you've wanted to get back at him? Win your money back? I know I have. I try to avoid it, of course, but I can sometimes sense that feeling where I want to do it. People who seemingly have no idea what they're doing taking my money makes me slightly sick to my stomach, but it happens all the time. What's worse, I'm probably a part of the problem, and chances are you are too. Let's say, for the sake of argument, that you're sitting at a table where there's this guy whose luck is just insane. He's outdrawn you on the river four times in the last 15 minutes, and you're pissed off. You're not going to take this kind of crap. So you get pocket aces, and you raise preflop. He calls two cold, no surprise there - he calls with anything that he can reasonably identify as two cards, it seems. So the flop comes, and you don't hit a set. He checks, you bet, he calls. The turn shows a brick, he checks to you, and you bet, and he checkraises. Steeming with fury, you see your chance to win some of your money back and you re-raise him. Take that you miserable luckbox! He calls. Then he bets the river, and again you raise. He calls, shows you his two pair, and drags home the pot. Did you play it wrong? Too many unknown variables to say for sure, of course. I didn't mention anything about whether or not this player was passive or aggressive, but last time I did something like this, I didn't 3-bet the turn because I figured to have the best hand, nor did I raise the river because I thought he was overplaying a single pair or trying to bluff me. No, I raised because I wanted to punish him. And when that's my rationale for doing something, I'm better served taking a nap than playing poker. However, there's another potentially more important argument to be made here and that's the fact that he may have been correct to call preflop with 97s. He may have been correct to call on the flop with his pair of sevens, nine kicker. How do I figure? Because with the way you're playing, you're offering him implied odds of 5 big bets (10 small bets) if he hits! Before the flop, you're about a 4:1 favorite over him. When he calls two bets cold, he needs to win back at least 8 small bets in order to make his call profitable, and he has no problem doing that from a tilting player who's out to get him. What about his call on the flop? Again, it's only one small bet in a pot of (at least) 5 bets already. He has five outs, so he needs odds of about 10:1 to continue, but you're giving him a whole truckload of money on the implied odds platter. If he knew what you had, he'd virtually be wrong to fold. Now, you could argue that this idiot who keeps calling you down doesn't know the first thing about odds, and that he probably can't even spell "implied." And you may be right. But the fact that he doesn't know that he's playing correctly doesn't change the fact that he does. This isn't a strategy article, so I'm not going to teach you about cutting down implied odds for people who play recklessly, but I wanted to illustrate how your desire for revenge is hurting you, especially when it gives people correct odds to draw against you. Poker is a game of small edges. It's a little bit like operating a roulette wheel. You have the odds on your side, but someone who's always betting on black, while a clear loser in the very long run, could still win quite a heap of money over the course of one evening. You already know this. Do you understand it? Can you come to accept it? People who berate others for poor play, the table coaches, aren't smart players. They're not impressing anyone. The fact that the other guy got lucky when he hit his miracle runner-runner flush against your flopped straight doesn't go away because you yell at him about it. Honestly, when people get so upset about this happening that they just can't stop themselves from being rude, I always (silently) wonder how long they've been playing. It happens so often, so very often, that it's amazing how they seemingly haven't gotten used to it yet. And what's worse, they're apparently trying to stop the other guy from doing it again, when they should be rooting for him to make those calls every time! The best case scenario for a table coach is that the other players consider him a jerk. The worst case scenario is that someone who was having fun giving his money away suddenly wisens up and decides to play smarter, while everyone still thinks the table coach is a jerk. 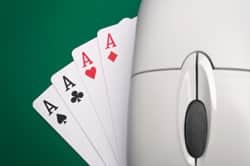 So, being almost done with this article series, I want to take the opportunity to wish you good luck, if you decide to pursue poker seriously. There's a lot of hard work needed to achieve real skill in this game, but it certainly is doable. Of the eight lessons I've written here, I truly feel that the part about having fun is the most important, and I hope you'll enjoy the game for what it is - a game of true skill, but absolutely sickening roller coaster rides of variance. Article series written by Fredrik Paulsson. Return to the Strategy Section for more articles like this!